I don’t like pie. I’m not a pie kinda gal. When given the option, I will pretty much choose any dessert except pie. The only pie that I’ve even attempted to make is a chocolate silk pie and that’s sort of cheating since it’s a pre-made graham cracker crust and chocolate pudding. 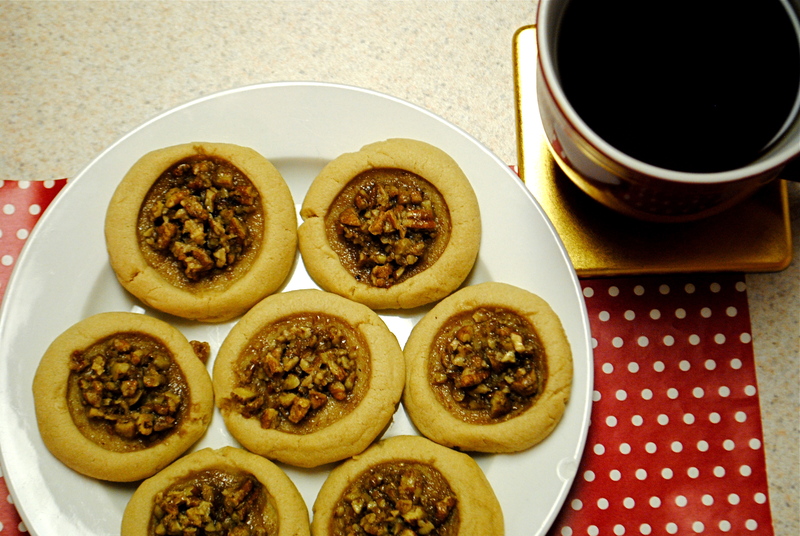 BUT, when you make a pie into a cookie, I’m totally on board! My mom made these cookies last year and pretty much hasn’t stopped talking about them. 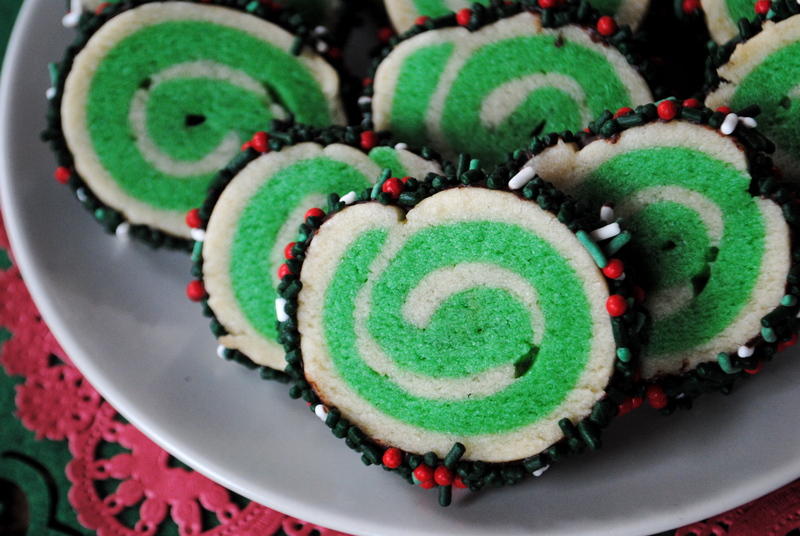 I knew they had to make the cut when I was making my list for my cookie-a-thon. makes 24; I’m no sure where this recipe came from as it was emailed to me. If you know the source, please feel free to send it to me. Heat oven to 350°F. Combine all cookie ingredients except flour and baking powder in large bowl. Beat at medium speed until creamy. Reduce speed to low; add flour and baking powder. Beat until well mixed. Shape dough into balls. Place 2 inches apart onto ungreased cookie sheets. 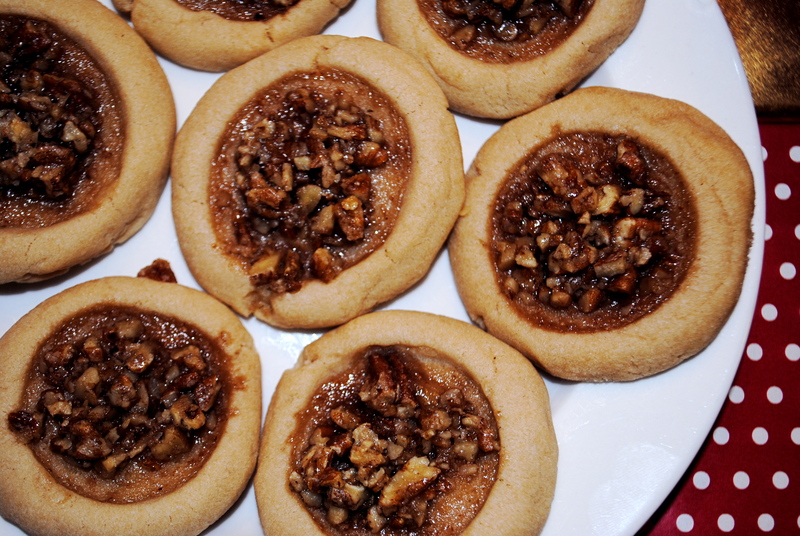 Make indentation in each cookie with thumb; rotate thumb to hollow out slightly. Combine all filling ingredients in small bowl; fill each cookie with 1 rounded teaspoon filling. Bake for 8 to 12 minutes or until lightly browned. Cool 1 minute; remove from cookie sheets. These cookies are SO good. With all the brown sugar that is packed into these babies, they are definitely sweet but the filling is so yummy! 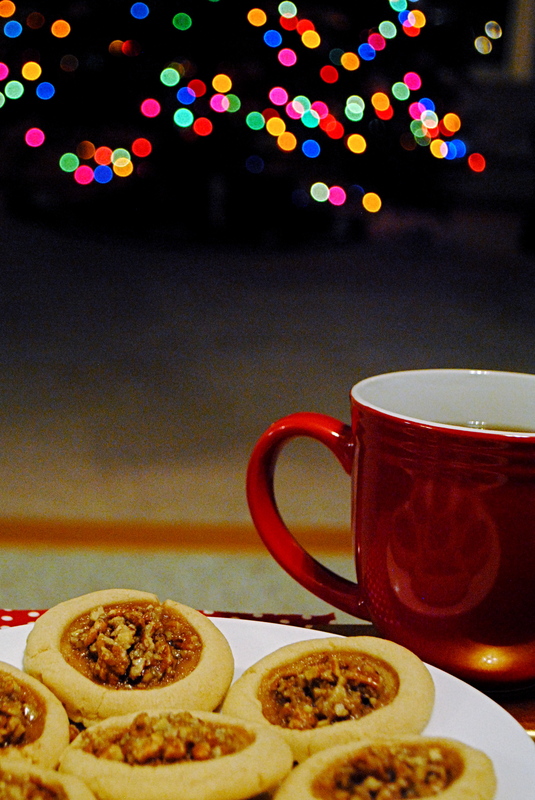 And they are just the perfect combo of two holiday favorites. 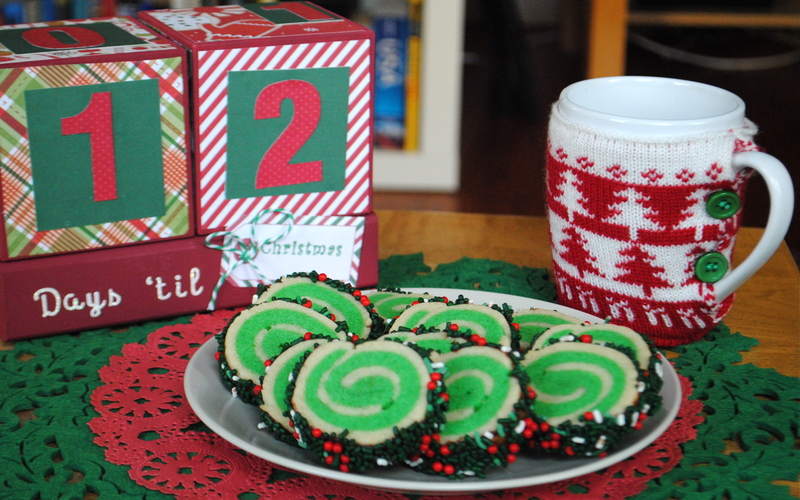 Yesterday there was no Day 4 of 12 Days of (vegan) Christmas cookies and here’s why- Procrastination failed me for the first time ever. See, as I’ve mentioned before on this blog, Procrastination and I go way back, like Middle School days. I had to write a paper for DARE, waited until the night before and won an award. It was all down hill after that. Making an entire Civil War scrapbook for high school, complete with tea stained pages? Done the night before. Got an A++ (yeah, I was that girl). Final papers in college that were an obscene amount of my grade? Done the night before, hopped up on instant vanilla cappuccinos for the machine. Still got A’s and B’s. Gah! Bad. Is that corn in there? What is happening? Who would want to eat that? So I have learned my lesson and will do my best not to procrastinate. 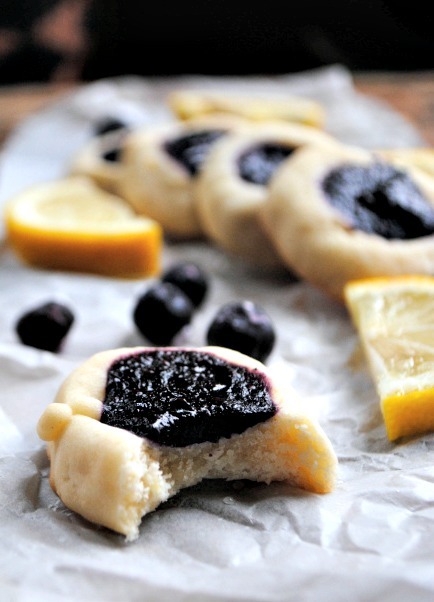 And here are some lemon thumbprint cookies that look about a thousand times more edible than that cookie up there. Add frozen blueberries and maple syrup into a medium pot and bring to a simmer. After 5 minutes or so, stir in the chia seeds. Continue to cook down the mixture for about 15 minutes, or until thickened. Chill in the fridge for a couple of hours to thicken it up even more. You can serve it as is or if you want it smoother, mash it with a potato masher or use an immersion blender. I used an immersion blender as I don’t like chunky jam. Also, this recipe makes a lot so you will have leftovers. It is great on toast, ice cream, etc. Pre heat oven to 350 degrees. Line 2 baking sheets with parchment paper and set aside. With a mixer, beat Earth Balance and sugar together in a large bowl until well combined. Beat in Ener-G eggs, lemon zest, lemon juice, and salt. Roll tablespoons of dough into balls. Place balls on prepared baking sheets about 1 inch apart. Make a deep indentation in center of each ball. 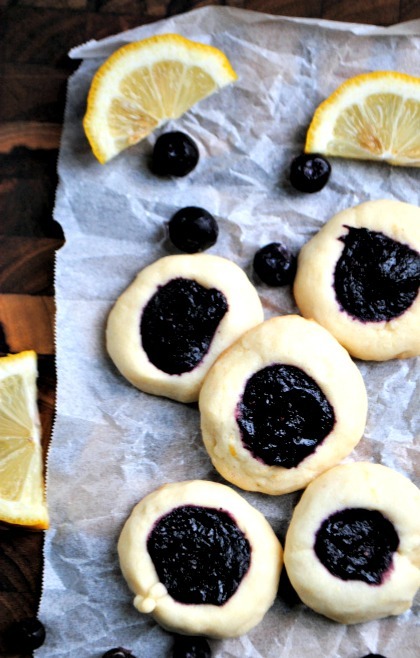 Fill the indentations with your blueberry jam. Bake cookies until firm and lightly golden on bottom, about 18 to 20 minutes. Alternatively, you can wait to fill your cookies after you bake them. Just make your indentation as noted above and bake like that for 18-20 minutes. 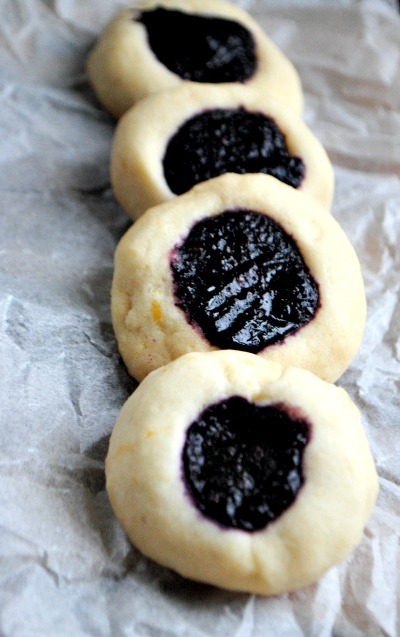 I preferred baking the jam in the cookie because I found that it helped thicken the jam further, keeping it on the cookie; that it provided a moisture cookie; and when the cookies are baked without the jam, the indentations kind of disappear a bit. But you can make them however you prefer. 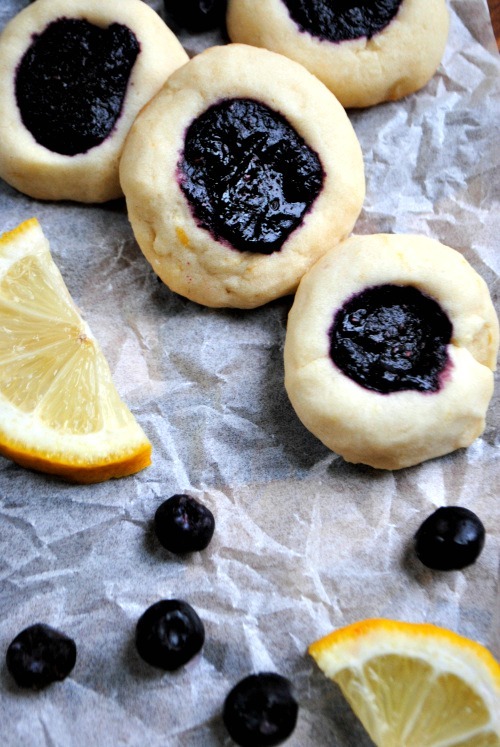 These cookies are definitely an ode to my mom, who loves all things lemon. 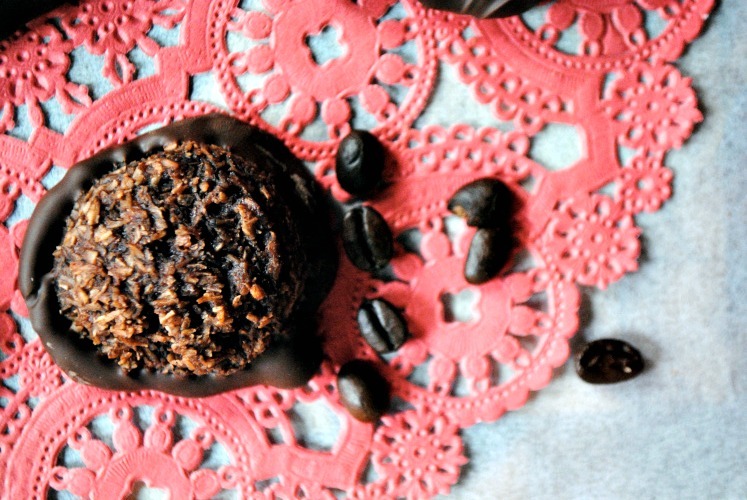 When I was making my cookie list, my initial list had 12 chocolate cookies with minor variations- chocolate and peanut butter, chocolate and mint, chocolate and chocolate… I realized that I wasn’t exactly providing a wide variety of options so I spiced things up a bit and made sure I included a cookie for the non-chocolate lovers. Now, I’m thinking of pulling an all-nighter, College style, to complete my Christmas cards for tomorrows. Leave me your suggestions on your favorite holiday movies to get me in the spirit and keep me going through those long hours of gluing. Ah, Christmas. The season of cakes, cookies, candies and booze. Dinner parties, luncheons, cookies swaps and way less gym time then you would probably like. There is just so much food everywhere. Clearly, as I am celebrating 12 straight days of cookies, I am not opposed to any of this but it is nice to have a healthier options every now and then. And that is something that I really wanted to keep in mind during this cookie marathon- that not everyone wants sugar-loaded treats. Sometimes, it’s nice to have a little break from the sugar coma. 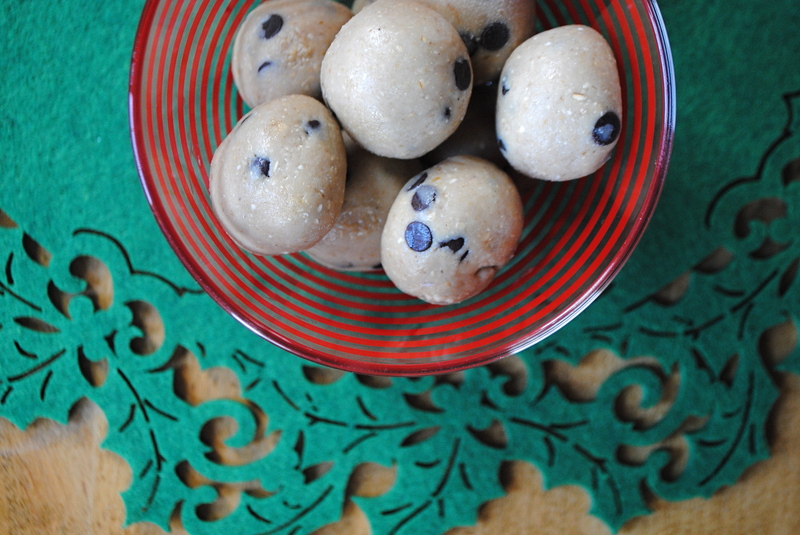 Which is why for Day 2 of 12 Days of Christmas Cookies, I’m sharing with you healthy cookie dough bites! 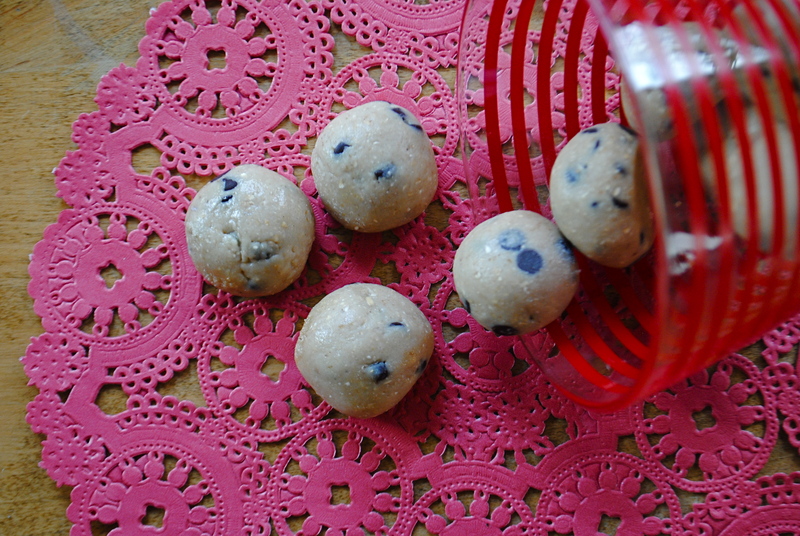 Transfer your dough into a mixing bowl and stir in chocolate chips by hand. Chill for around an hour. 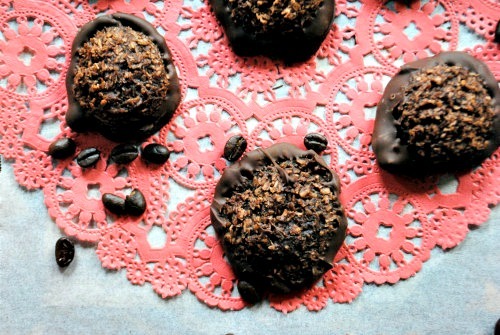 Roll the dough into approximately 12 chocolate truffle-sized balls. Enjoy immediately or store in the fridge/freezer for later. 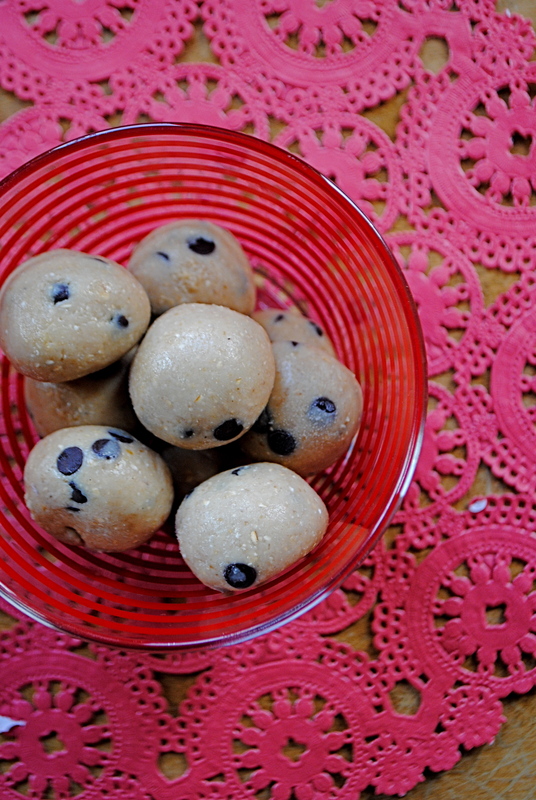 I really like these cookie dough bites for a treat at home. At work and friends, you are inundated with sugary treats. When you are home and have down time, it’s nice to have a healthier options, especially since these are best cold. I keep mine in the freezer and tend to reach for them in the evening after dinner. You can definitely gift them but they tend to get sticky and soft at room temperature so keep that in mind when thinking of presentation. I tried to photograph them at room temperature in a mason jar and they sort of just slowly mushed together. Maybe try a tin and put them in a single layer in mini cupcake liners like a box of chocolate? That would be super cute and a great alternative to cookies for people that are allergic to gluten (just use gf oats), dairy or are just looking for a healthier treat. 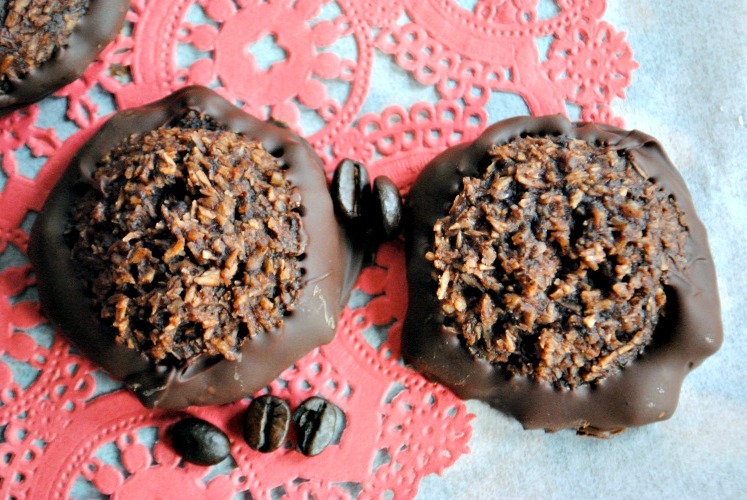 Plus, they’re no bake so perfect for people who are allergic to their oven. Tomorrow, we’ll be back to the sugar, though, so don’t worry if this healthy detour is scaring you. I have plenty of chocolate and peppermint and sugar in store for you. 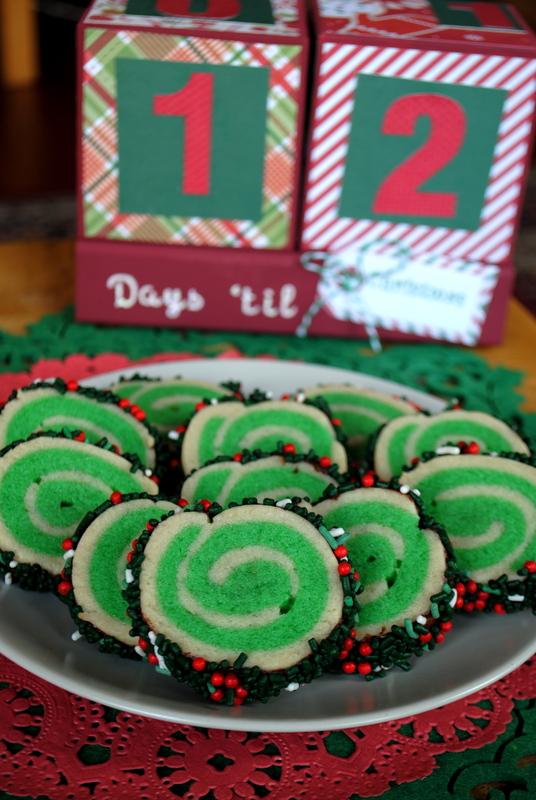 Welcome to Day 1 of our 12 Days of Christmas Cookies!! 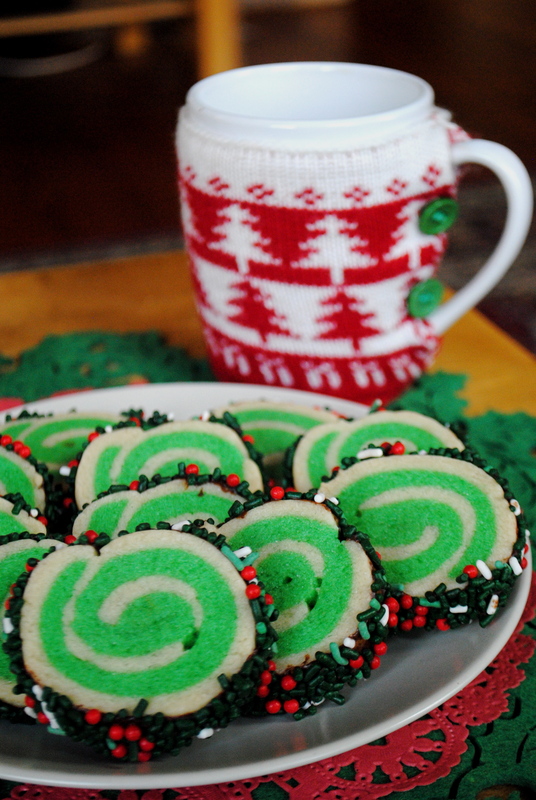 As pumped as I am for the first Christmas event on Wicked Vegan, it took me almost no time to come to the conclusion that this little special is going to involve me eating a LOT of cookies. My plan was to give some away but, well, that is proving better said then done. For instance, this week I baked up 4 types of cookies, all which I photographed today since I was home during the day (Hello, natural lighting!!). Which means, all week, I have had fresh-baked cookies chillin’ in my house, including some of the best chocolate chip cookies I have ever eaten. Yeah…let’s just say you won’t be seeing the whole batch of those chocolate chip cookies. These cookies, though, are just too adorable to keep to myself! I didn’t intend for it to happen but don’t they look a little like christmas wreaths?? So cute! 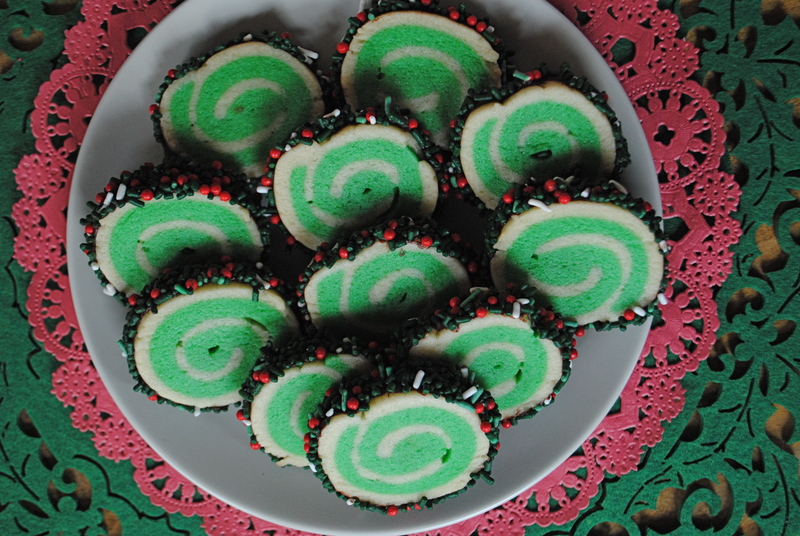 These are just plan ol’ sugar cookies with a little pizzaz thrown in. Tired of seeing crazy concoction cookies like, bacon, whiskey cookies with artisan chocolate chips or blueberry basil thumb prints with fresh lemon curd made with the tears of virgins? Yeah, it’s getting a tad out of control. These are great because they are simple and tasty without losing any of the presentation that you may want for gifts or holiday parties. about a cup of sprinkles of your choice. I would advice you use a smaller type such as nonpareil. The bigger jimmies I used had a hard time sticking. 1. In a large bowl, cream butter and sugar using electric mixer. Add Ener-G egg and vanilla extract; mix well. Stir in flour and salt, mixing until well blended. 2. Divide the dough into two equal portions. Add food coloring to one portion; knead to blend. Shape each portion to form 4 x 5-inch rectangles; wrap in plastic wrap. Refigerate dough 45-60 minutes. 3. Remove dough from refrigerator. Roll out colored dough on Parchment Paper (in can be a little sticky if it warms up or is over worked) to form 6 x 11-inch rectangle; set aside. Repeat with remaining dough. Place white dough rectangle over colored dough rectangle. Gently press dough together. Starting on one 11-inch edge, roll up dough jelly-roll style. Wrap roll in plastic wrap; refrigerate 1-2 hours until firm. 4. Preheat the oven to 375 F. Remove roll from refrigerator. Slice roll crossways into 1/4-inch rounds. Place each round onto ungreased cookie sheet, spacing 1 inch apart. 5. Bake 8-10 minutes or until the bottom edges are lightly golden brown. Remove from oven. Cool cookies on baking sheet 2-3 minutes. Transfer cookies to cooling rack; cool completely. 6. Places sparkles in a small bowl and set aside. 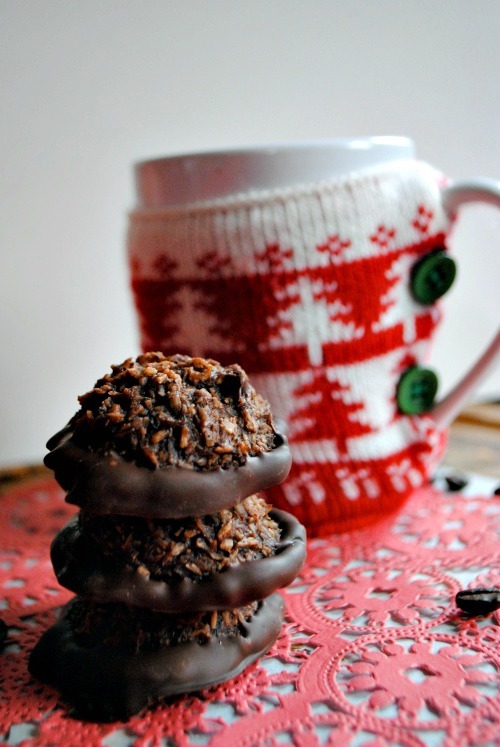 Place chocolate in a microwave safe bowl. Microwave for 30 seconds and give chocolate a stir. Repeat this process every 30 seconds until the chocolate is melted. 7. Spread a small amount of chocolate around the edge of the cooled cookie. Immediately roll edge in sprinkles. 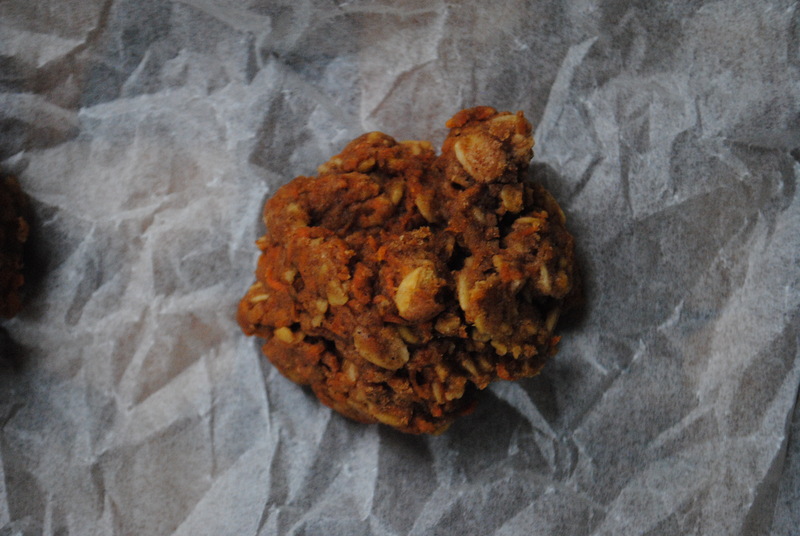 Place cookie on parchment paper to set. You can’t go wrong with a well made sugar cookie at a party, especially when they are this cute. I also love that you can totally make them your own by switching up the dough color and the sprinkles. Green and red dough with white sprinkles maybe? Blue and white with Cake Sparkles for a more winter or Frozen theme? Totally doable! If you are using a lighter colored sprinkle, I would maybe try switching out the chocolate for a light coating of icing. Something like this may work better. I haven’t tried that but I would imagine it would look a bit nicer. PS. How cute is my Christmas count down clock? My mom made it for me after she saw my Halloween one. Crafts and cookies- they are definitely two of the perks of Christmas time!! What cute crafts are you working on this year?